However, after Lonely Planet’s naming of Kotor as one of the best places to travel in 2016, the destination picked up speed fast. Yet, Kotor is striving hard to keep its atmosphere despite the cruises that continue to cycle through. The city may have no sunbathing beaches, and no grand site to see, yet there seems to be this allure that continues to draw a large audience. There are so many things to do in Kotor you can easily spend a week here marveling in the beauty. Kotor is a moody well-preserved former Venetian city inhabited by less than 13,000 people. Once visitors pass through the city walls a labyrinth of marbled streets, old lamps, stones houses, and quiet piazzas await them. 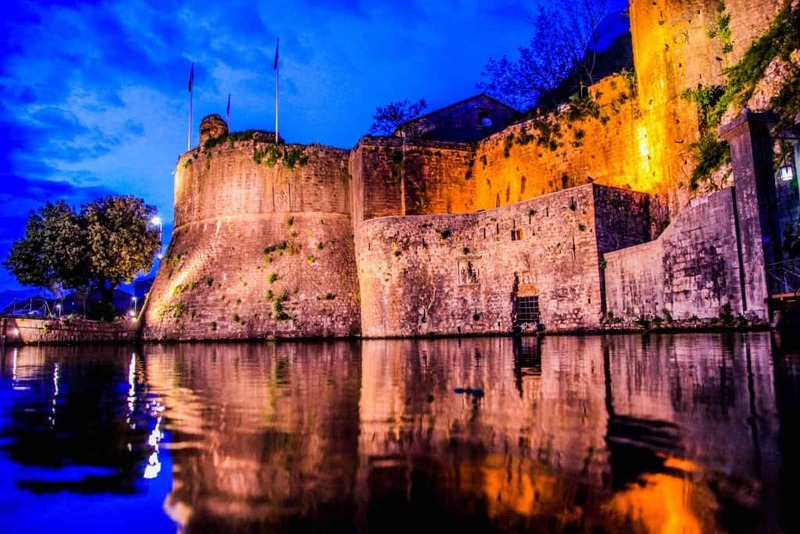 The old city is fortified and encompassed by imposing stone walls while the town itself sits at the foot of a gorgeous Adriatic bay with the Dalmatian mountains rising high up above turquoise waters. Some refer to the Bay of Kotor as being the southernmost Fjord in Europe, and with the stunning beauty of the bay it is easy to see why. It’s a magical destination that feels as if you’ve taken a step back into time. It didn’t take much convincing to get Tasha to return as we made our way North through the Balkans. The charm of Kotor is undeniable. It is a wonderful city to meander through old streets and piazzas. One of the best things to do in Kotor, Montenegro is walk in circles around the old town. 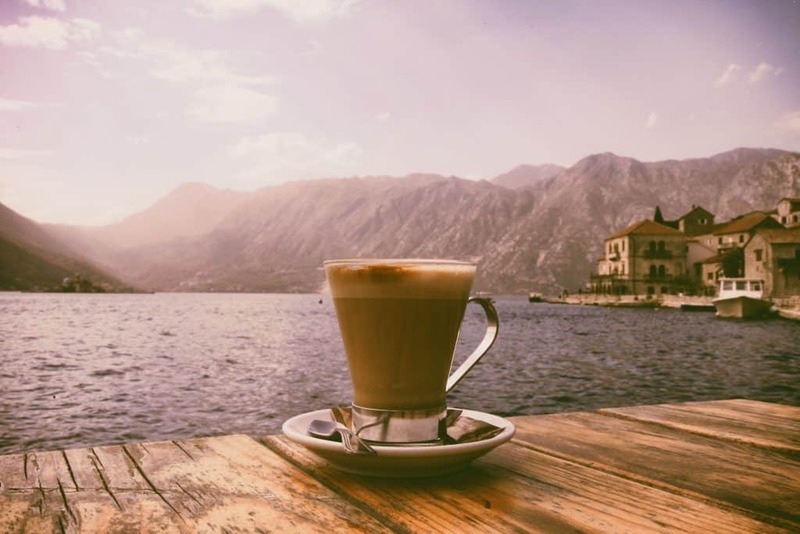 When you’re done meandering through town, Kotor is the perfect place to enjoy a cafe while basking in the sun and enjoying a stunning view. Every hour the church bells ring adding to the ambiance and magic of Kotor. The central point of the town is the Cathedral of Sveti Tripun, it is a cathedral that dates back to 12th century. 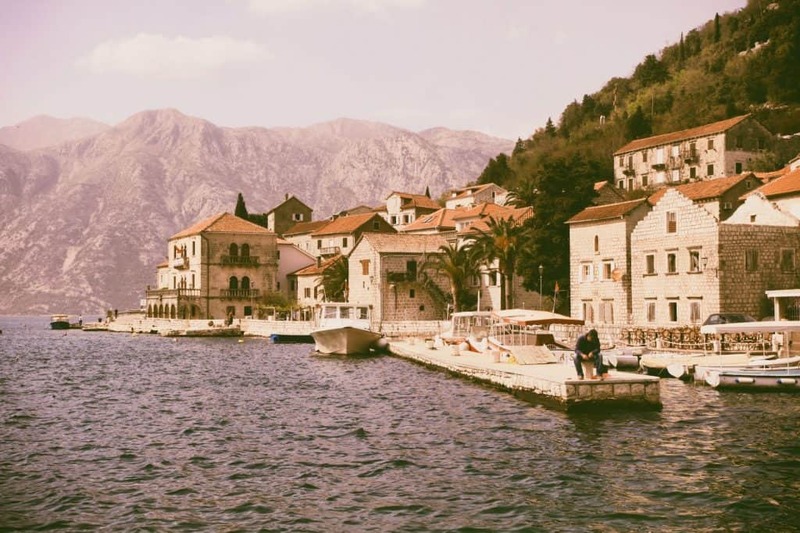 The allure of city extends beyond the city walls and into the surrounding area of the bay with places such as Perast, Tivat, and Herceg Novi. Out of all the things to do in Kotor, this is my number 1. Climbing the 1350 steps to the Castle of San Giovanni is a right of passage when visiting Kotor. It is one of the main attractions in Kotor, and from the castle the views over the bay are incredible. The initial ascent will be met with some huffs and puffs, but the top of the fortress is spacious and offers some exploration while overlooking the region. The climb takes about an hour to complete and the descent is always easier. We suggest climbing the hill in the morning to catch the best views, and it makes for a great start for the day. For the active bunch, you could throw on those running shoes for a heart-pumping morning workout. There are plenty of cafes to relax in and wonderfully quaint piazzas to dine in while visiting and checking out all the things to do in Kotor. Visitors have a wide variety of places to eat in and around Kotor, making it the perfect location for a summer in Montenegro. Our favorite places marry rich seafood from the nearby Adriatic Sea and ambiance of the region. You won’t be disappointed here. The classy Galion serves up wonderful food with stunning views of The Bay of Kotor sitting on glass terrace over the water. 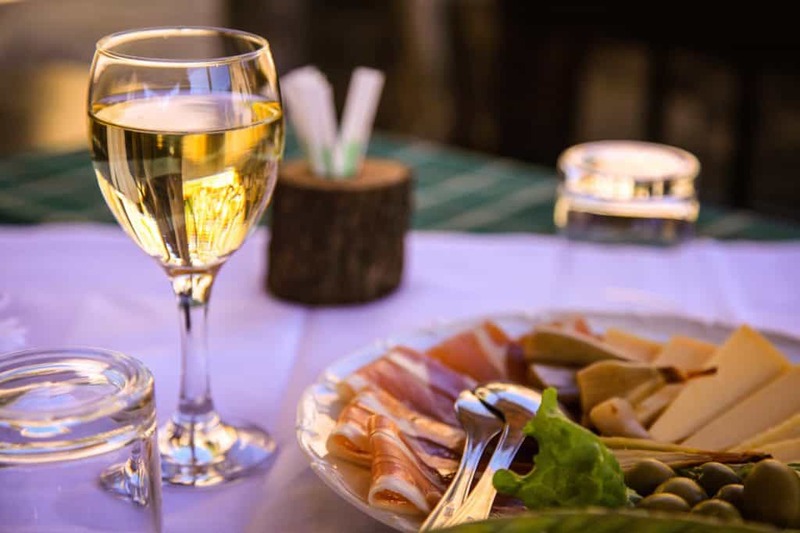 They serve up some of the best fish in town with splendid Montenegrin wines. Tucked away in the Bay of Kotor is Ćatovića Mlini is a splendid hidden gem in Montenegro. As we’ve said one of the greatest draws of Kotor is the ambiance. Ćatovića Mlini is located in a former farm along the bay nestled against the rising mountain ridge. Tasha would kill me if I didn’t include this one, but for a delicious dessert head to Astoria. It has an adjoining hotel with a hip interior that exhibits the local atmosphere. Ask for the Molten Chocolate Cake. You won’t be disappointed. For location, this restaurant takes the cake for us. Conte is reputed for being one of the best restaurants in Montenegro serving up great fresh seafood from the local fisherman of Perast. Perast is the town over from Kotor, and a must for those with the time. Read on below for more. About a 20-minute bus ride north of Kotor is the small village of Perast. 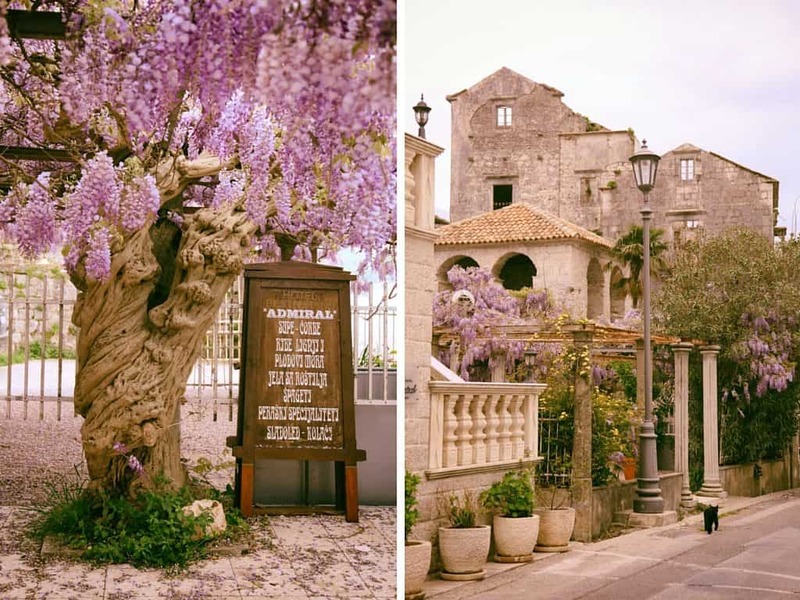 Traveling here is the perfect day trip from Kotor. Take the Blue Line bus that runs every 30 minutes along the main road to reach the town (€1.20). The town resides on a hill along the Kotor Bay coastline. There are locals around, but the area is known for being a quiet reprieve to enjoy the bay. No cruise ships drop anchor in Perast, so you already know you are beating those crowds. There are several old churches and museums to venture into, but we found the real charm to lie in just soaking in the ambiance of the cafes frequented by the locals. 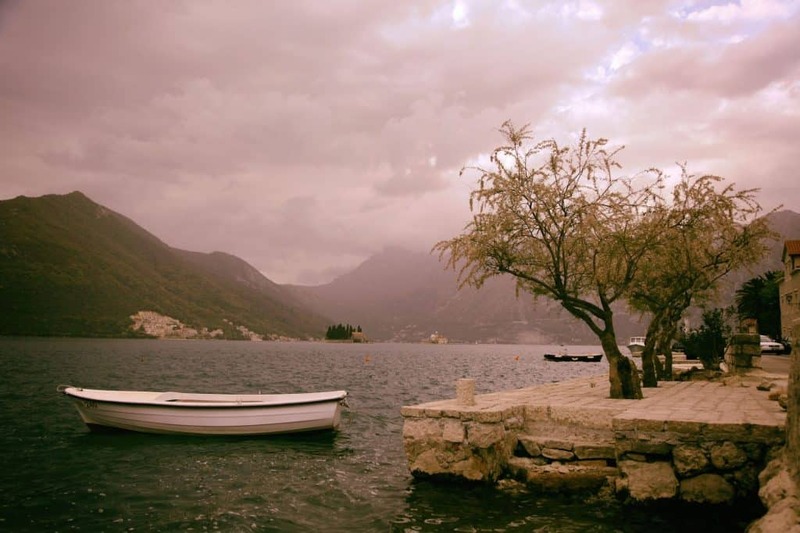 We found one of the most beautiful spots we’ve ever found in the Perast. 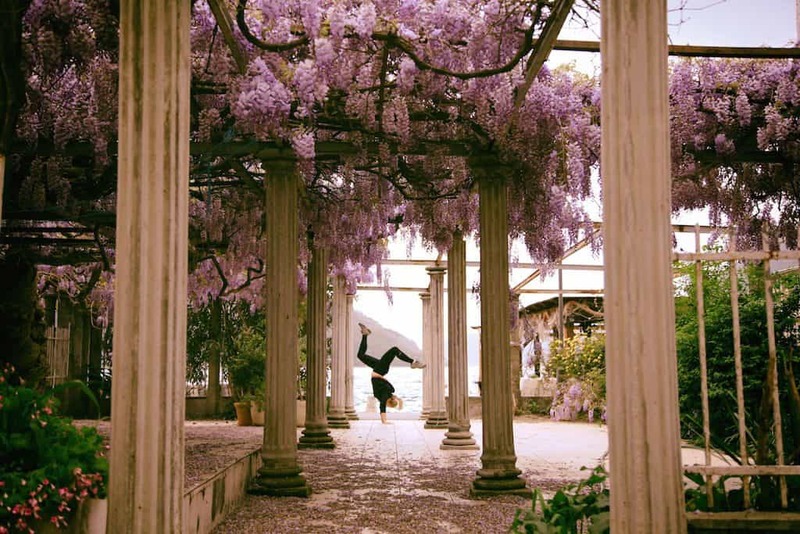 It was a small patio replete with concrete columns and fragrant wisteria. It was a photographers paradise. And of course, we had to do a handstand. We get a lot of questions on where to find this location and I don’t know the exact name of it. All I can say is that is right along the water past many of the main shops in Perast. The town is not that big so it shouldn’t be too hard to find. The photo below was taken in early April. There are two islands right off the shore of Perast that can be reached by boat for €5 a person. One of the islands is private so the boat will not be able to dock there, but it makes for great photos. There are also a few restaurants to have a bite to eat in, and small guesthouses in Perast also double as cafes. There are only two Catholic Cathedrals in all of Montenegro and this is one of them. Saint Tryphon’s Cathedral stands tall over the town of Kotor and is easily one of its highlights for both visiting and admiring from the outside. This cathedral is one of the most beautiful in not just Kotor, but all of the Mediterranean. It’s hard to miss this amazing piece of architecture and the majestic mountains that surround it. Once inside make sure to go upstairs to the Sacral Air Museum if you are into old paintings and artifacts dating back to the 1200s. Visiting the Kotor Cathedral is one of the best things to do in Kotor, but I would suggest going early before the crowds come. Saint Nicholas is one of Kotor’s Orthodox churches. It’s impressive in size and beautiful to look at. This is another church that you simply can’t miss when you are in the town center. Being built in 1909 it is actually quite young compared to many other churches throughout Europe. It’s a must to venture inside and take a look at the relics of St. Nicholas. While entrance is free it’s traditional to purchase a few candles for all your living and deceased loved ones. Light a candle, kiss, and pray for them while placing the candles in the stands. The top shelf is traditionally for the living, while the bottom for the dead. Still wondering what to do in Kotor? One of the best things to do when you are visiting any European city or town is to visit their local church. Saint Luke’s is small in comparison to Saint Tryphon’s Cathedral and the Church of Saint Nicholas, making it very easy to skip over, however I urge you not to. Sveti Luka was built in 1195 and is well revered among the towns people of Kotor. Built as a Catholic church, it was shared between the Catholic and Orthodox alters from 1657 until 1812. Since then it is an Orthodox church, but the 12th-century frescos can still be seen. To this day visitors can go in and see two chapels inside – one for Catholics and the other for Greek orthodox. This is a strong demonstration of the peaceful coexistence between the two religions. Don’t just take in the views of the coast from land, get out on on the Adriatic Sea on a Kotor excursion. A boat tour is a very popular half day tour to see some beautiful sights in Montenegro. Many start with Our Lady of the Rocks, and then they continue through the Verige Straights and along the beautiful and calm Herceg Novi Rivera. Out of the bay, you’ll be able to see Mamula Island, which was a prison during WWII, and then most tours end at the Blue Cave. The Blue Cave is a brilliant cave with unbelievable clear turquoise and blue water where you can swim. Make sure to go on a sunny day if possible to see just how blue it really is. One of the best things to do in Kotor at night is just wander around the Old Town. Once you walk just outside of it and see the city walls all lit up along the coast you truly feel as if you’re in another world. 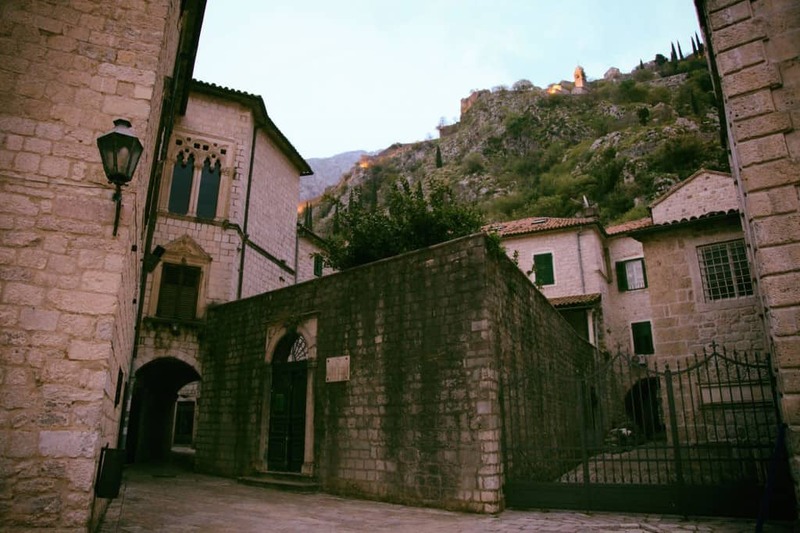 Where to Stay in Kotor? Kotor has some fabulous Airbnb’s to choose from. To feel more at home we use Airbnb – you can check out some tips and read more about getting an Airbnb coupon code here. Or just take this coupon for your first stay! Hotel Villa is right next to St Tryphon and is located in a great location in the Old Town. If you are looking for a hotel that makes you feel as if you are truly in the old town this is a winner. This hotel has some of the best reviews in the entire town of Kotor. This hotel is a renovated 18th century building with plenty of outdoor space to enjoy the sunlight. Croatia Bus: Croatia Bus is the largest bus company in Croatia and runs routes from Croatia out to the surrounding Balkan area. They have modern buses with Wifi and toilets and definitely give them the seal of approval. Kotor is sure to be a highlight of anyone’s trip to Montenegro or around Europe for that matter. It is one of the most beautiful destinations we’ve been to in the Balkans and can not suggest it enough. The city is readily accessible with buses running daily from Dubrovnik, Tirana, Mostar and many more cities in the region. , or to feel more at home and try Airbnb. Here is a coupon for your first stay! Guide Book: Sometimes it’s just nice to have a real book and look up the top things to do in Kotor there. We like Lonely Planet. Have you been to Montenegro? What things did you do in Kotor?